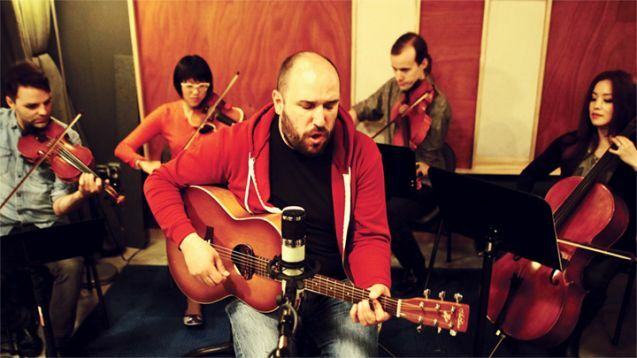 David Bazan is a Seattle singer-songwriter best known as the creative force behind Pedro the Lion, a local indie-rock band which broke up in 2006 when Bazan went solo. However, this weekend Bazan is joining forces with a new type of band: the Passenger String Quartet. After a long series of sold-out shows across the U.S., this weekend Bazan and the Passenger String Quartet are bringing the tour back home with a performance at Seattle’s own Neptune Theatre. The show is this Friday, Nov. 21. Doors open at 8 p.m. and the performance begins at 9 p.m.
Halloween may be over, but that doesn’t mean you can’t indulge in a spooky, spoofy musical performance every once in a while. This weekend TangleTown Trio is presenting “Night of the Living Composers.” A most unusual performance, the concert features the works of several contemporary, living composers. TangleTown Trio is a local ensemble composed of mezzo-soprano and composer Sarah Mattox, violinist and violist Jo Nardolillo, and pianist Judith Cohen. The group specializes in classical music inspired by different genres of American music, including jazz, folk, and theatre. For this weekend’s performance, they are tackling the works of many local living composers, including Christophe Chagnard, Bern Herbolsheimer, Carol Sams, Randolph Hokanson, and several others. The concert features but one dead composer—see if you can tell which one is the ghost. “Night of the Living Composers” is this Sunday, Nov. 23 at the Columbia City Theater. Doors open at 5 p.m. and the performance begins at 5:30 p.m. The program features piano trios ranging from the passionate, poignant Beethoven to the experimental, aleatoric Ives. The concert will also feature trios by Brahms and Garcia, rounding out a program of exceptional chamber works from throughout history. The concert is this Sunday, Nov. 23 at Cornish’s PONCHO Hall at 7 p.m.